Question: How do I find and login to the official Walmartone associate page? Visit: https://us3.walmartone.com/ in your internet browser. You can also type in “walmartone.com” in your browser’s address bar, or search Google for “Walmartone”. Or click here. You will then find yourself on the official Walmart Associate Login portal. Find the “Sign In” tab in the top left corner. Click the link and you will be transferred to the WalmartOne login page. On the Walmart One login screen, enter your Walmart User ID and your WalmartOne password. After clicking on “Login”, you will be logged into the Walmart employee portal. Remember, that WalmartOne is different from the Walmart WIRE. You will need to create a new account on the WalmartOne website to use the system. You will need your WIN. The Username ID and Password for Walmart Wire is different from that of WalmartOne. The old WalmartOne website and the in-store Walmart Wire platform has merged. To find the new, aptly named, Walmart OneWire login page, visit https://One.Walmart.com, and click on the yellow Walmart Spark logo (it is small). This will open the new Walmart OneWire login page. However, to access through this page, you must have enrolled to the 2-Step-Verification login process at a Walmart Store while clocked in. 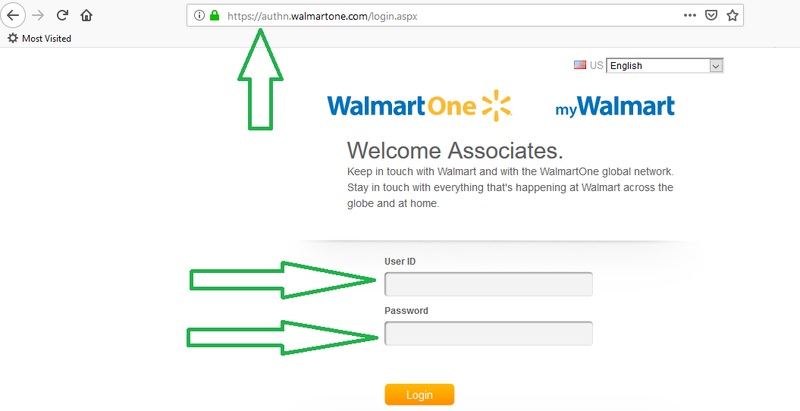 WalmartOne Login – WM1 App. Question: How do I log in to Walmartone from my mobile phone? Answer: You can also choose to log in to the WalmartOne portal through the WM1 and the My Walmart Schedule mobile phone apps, or through your mobile phone’s internet browser. Find the WM1 app on Apple iTunes or Google Play by searching for “WM1”. For the “My Walmart Schedule” app, search for “My Walmart Schedule”. Download the WM1 or My Walmart Schedule app. Open the app and enter your Walmartone login credentials. Question: Can I log in to Walmart Wire from home? Answer: No, Walmart Wire is Walmart’s intra-store employee portal. You can only access “Wire” from a store computer. From home, you will need to access Walmartone, instead. Question: I cannot log in to Walmartone. What Am I doing wrong? Check that your CAPS LOCK button is OFF, as passwords are case-sensitive. Try logging in through the WalmartOne WM1 app, or through your mobile phone browser. Try logging in with another browser, like Opera, Mozilla or Chrome. Clear your browser cookies and cache and try again. I have forgotten my WalmartOne Password. I have you have lost or forgotten your Walmart One password , visit the Walmartone login page, and click on “Forgot Password” link. The direct link is here. Enter your Username, solve the CAPCHA and request a verification code. Paste that code in the verification code box and type a new password in the Create Walmartone Password box, followed by clicking on the submit button. I Have Forgotten my WalmartOne ID Username. I have you have lost or forgotten your Walmart One Username, visit the Walmartone login page, and click on “Forgot ID” link. The direct link is here. Enter your associated email address, solve the CAPCHA and click on Go. Follow the instructions to recover your WalmartOne User ID . Still have questions? Share your problems or experiences below. 3 WalmartOne Login – WM1 App. 6 I have forgotten my WalmartOne Password. 7 I Have Forgotten my WalmartOne ID Username.